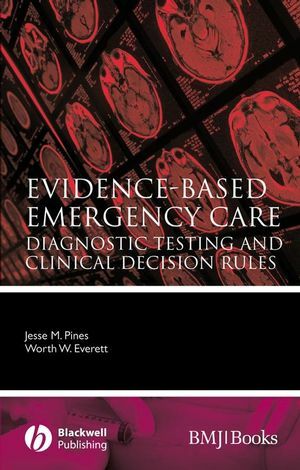 This useful handbook provides a concise compilation of the evidence supporting diagnostic testing and clinical decision rules in emergency care. Clinical decision rules are now widely recognised as best practice for the ordering of diagnostic tests in the emergency department. Aimed at all physicians working with emergency and acute patients, the book begins with an overview of how to evaluate a diagnostic test using an evidence-based approach, followed by an explanation of the clinical decision rules and the methods of assessing the strength and applicability of the clinical prediction rule. For each test and clinical decision rule, the most current and best available studies in the literature are discussed and applied to emergency department and acute care patients in addressing the question at hand, followed by an overall recommendation on how to use the test or rule in the clinical context. Evidence-Based Emergency Care is an accessible and extremely useful reference for physicians at all levels to use in applying an evidence-based approach to ordering and interpreting tests in an acute care environment. Section 1: The Science of Diagnostic Testing and Clinical Decision Rules. 1 Diagnostic Testing in Emergency Care. 2 Evidence-Based Medicine: the Process. 3 The Epidemiology and Statistics of Diagnostic Testing. 6 Cervical Spine Fractures in Older Adults. 7 Cervical Spine Fractures in Children. 11 Blunt Head Trauma in Children. 12 Acute Ankle and Foot Injuries. 19 Serious Bacterial Infections and Occult Bacteremia in Children. 20 Bacterial Meningitis in Children. Section 5: Surgical and Abdominal Complaints. 28 Acute Nonspecific, Nontraumatic Abdominal Pain. Section 8: Miscellaneous: Ophthalmology, Hematology, Rheumatology, and Pulmonology. 37 Pulmonary Embolism and Deep Vein Thrombosis.